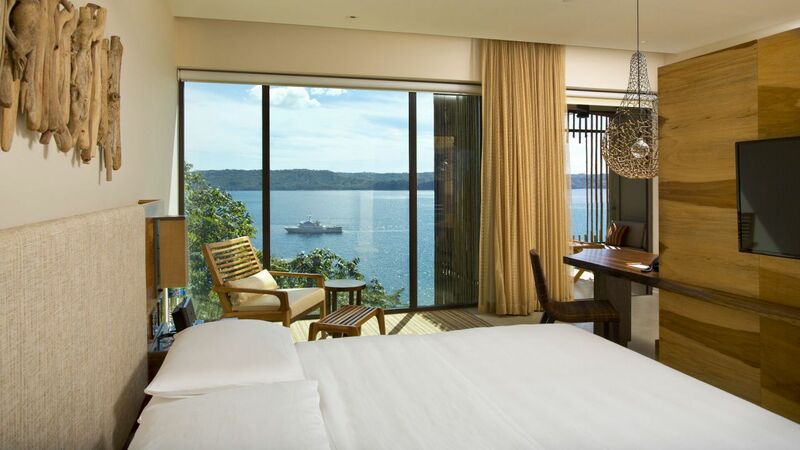 Creating an elegant treehouse feel, all 132 rooms and 21 suites face Culebra Bay from a hillside perch. Outdoor terraces offering immersive Costa Rican views of the tropical forest and bay, are complemented by the room’s modern design infused with natural materials and local character. Complimentary snacks and non-alcoholic beverages make you feel right at home. This exquisite 3,218 square foot (299 sq.mt.) residence with an oversized terrace and private pool will provide family and friends with an immersion in the lush tropical forest. This suite features a king-bedded master and second bedroom with two double beds, living room, dining area, kitchen and exclusive courtyard entry. 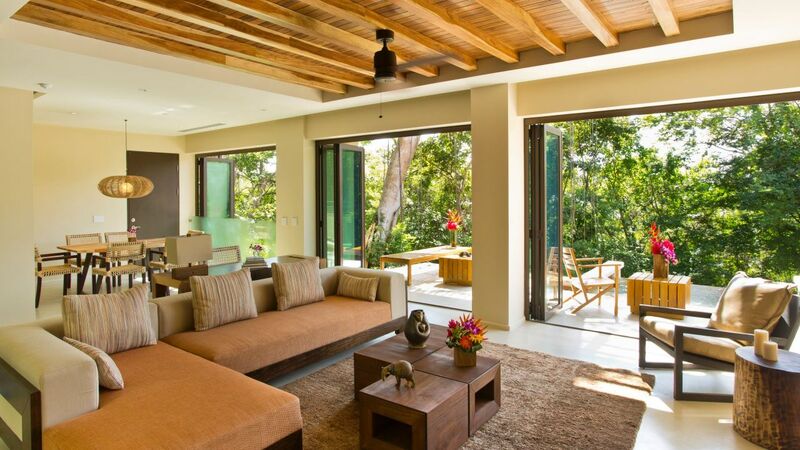 Modern design blends with touches of local character such as woven textiles, solid woods and carved artifacts to highlight the Costa Rican aesthetic. The master bathroom includes a walk-in rain shower and a private terrace with a relaxing outdoor soaking tub. An additional half bathroom adjoins the living room. Complimentary gifts and deluxe amenities include custom fedora hats and Andaz flip-flops, use of espresso maker, wireless internet access, local phone calls, non-alcoholic minibar beverages and snacks restocked daily. This room may be connected to an additional double bedded room, making it a three bedroom suite. Please contact the resort to reserve this suite. This is a premium suite. See World of Hyatt program terms for upgrade eligibility. This is a premium suite. See World of Hyatt program terms for upgrade eligibility. Be immersed in the lush tropical forest and nature in this 1,765 square foot (164 sq. mt.) corner suite, featuring one king-bedded master, living room, pantry, dining area and spacious terrace with a private plunge pool. 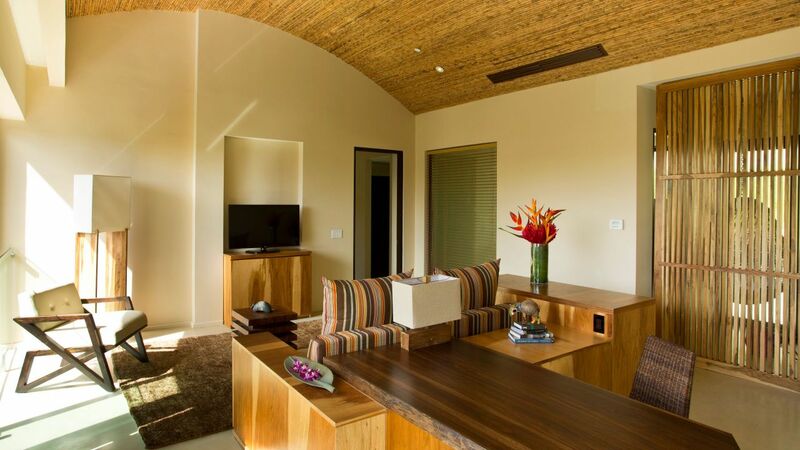 Modern design blends with touches of local character such as woven textiles, solid woods and carved artifacts to highlight the Costa Rican aesthetic. The extra-large bathroom includes a soaking tub and separate walk-in rain shower that opens onto the terrace. An additional half bathroom adjoins the living room. Complimentary gifts and deluxe amenities include custom fedora hats and Andaz flip-flops, use of espresso maker, wireless internet access, local phone calls, non-alcoholic minibar beverages and snacks restocked daily. This room may be connected to a double bedded room, making it a two bedroom suite. This is a premium suite. See World of Hyatt program terms for upgrade eligibility. This is a premium suite. See World of Hyatt program terms for upgrade eligibility. Enjoy enhanced views the sapphire blue waters of Culebra Bay and the resort in this 1,173 square foot (109 sq. mt.) corner suite, featuring a king-bedded master bedroom, living room, executive work area and spacious balcony. Modern design blends with touches of character such as woven textiles, solid woods and carved artifacts to highlight the Costa Rican aesthetic. The extra-large bathroom includes soaking tub and separate oversized walk-in rain shower and an additional half bathroom adjoins the living room. 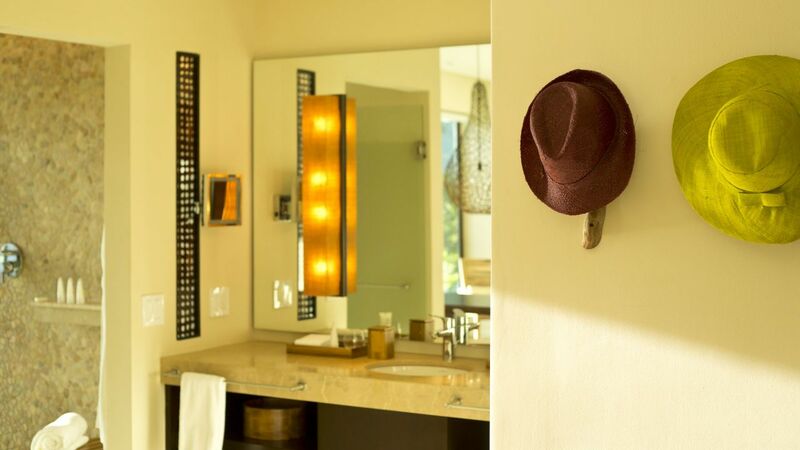 Complimentary gifts and deluxe amenities include custom fedora hats and Andaz flip-flops, use of espresso maker, wireless internet access, local phone calls, non-alcoholic minibar beverages and snacks restocked daily. This suite has an adjoining guestroom which may be added for teens or friends traveling together. Please contact the Resort for details. This is a premium suite. See World of Hyatt program terms for upgrade eligibility. This is a premium suite. See World of Hyatt program terms for upgrade eligibility. Enjoy impressive views of the resort and magical tropical forest in this 1,173 square foot (109 sq. mt.) corner suite, featuring a king-bedded master bedroom, living room, enhanced work area and spacious balcony. Modern design blends with touches of character such as woven textiles, solid woods and carved artifacts to highlight the Costa Rican aesthetic. The extra-large bathroom includes soaking tub and separate oversized walk-in rain shower and an additional half bathroom adjoins the living room. Complimentary gifts and deluxe amenities include custom fedora hats and Andaz flip-flops, wireless internet access, local phone calls, use of espresso maker, non-alcoholic minibar beverages and snacks restocked daily. This suite has an adjoining guestroom which may be added for teens or friends traveling together. Please contact the Resort for details. This is a standard suite. See World of Hyatt program terms for upgrade eligibility. This is a standard suite. See World of Hyatt program terms for upgrade eligibility. Bask in the panoramic views of Culebra Bay in this 560 sq. ft. (52 sq. mt.) king-bedded room. The river stone rain shower opens onto the spacious balcony and organic design elements infuse the natural surroundings into your guestroom. Enjoy spectacular views of the sapphire blue waters of Culebra Bay in this 560 square foot (52 sq. mt.) guestroom, featuring two double beds and a spacious balcony. Modern design blends with touches of character such as woven textiles, solid woods and carved artifacts to highlight the Costa Rican aesthetic. The bathroom's walk-in rain shower opens onto the balcony providing full immersion in nature. Complimentary gifts and deluxe amenities include custom fedora hats and Andaz flip-flops, wireless internet access, local phone calls, non-alcoholic minibar beverages and snacks restocked daily. Connecting room configurations are available, please contact the Resort. Maximum guests per room: 2 adults & 2 children under 12 years or 3 or 4 adults at extra cost. An extra bed cannot be added to this room. Check into your own personal tree house with views of the Culebra Bay and the magical tropical forest. Modern design blends with touches of character such as woven textiles, solid woods and carved artifacts to highlight the Costa Rican aesthetic in this 560 square foot (52 sq. mt.) 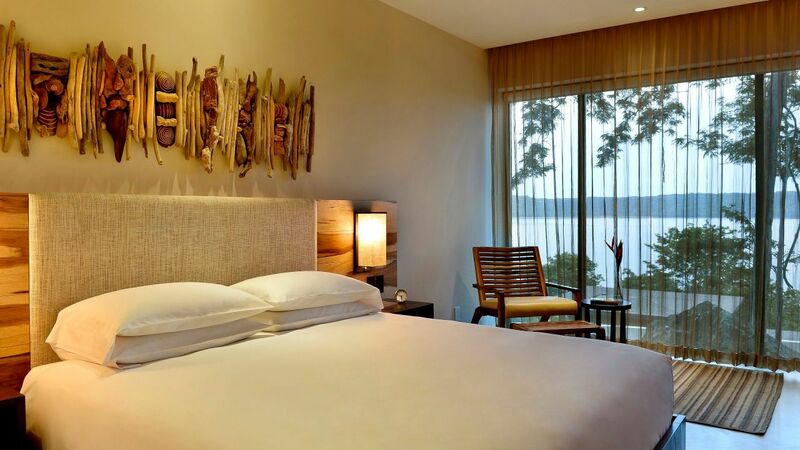 guestroom, featuring one king bed and a spacious balcony that grants partial bay and tropical forest views. 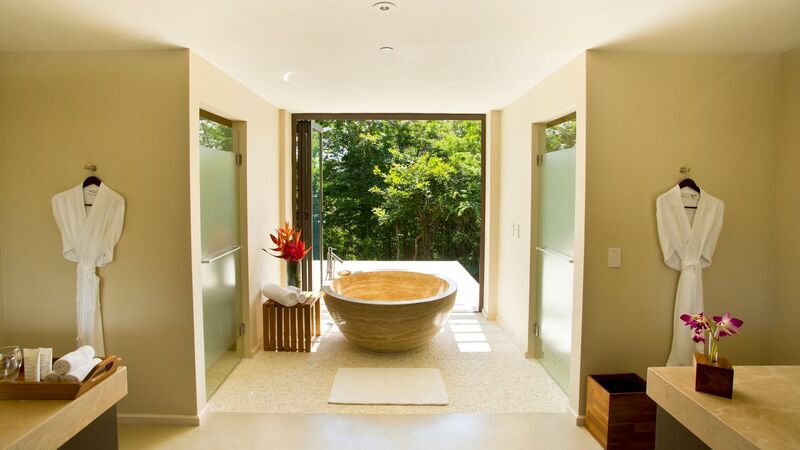 The bathroom's walk-in rain shower opens onto the balcony immersing you in nature. Complimentary gifts and deluxe amenities include custom fedora hats, Andaz flip-flops, wireless internet access, local phone calls, non-alcoholic minibar beverages and snacks restocked daily. 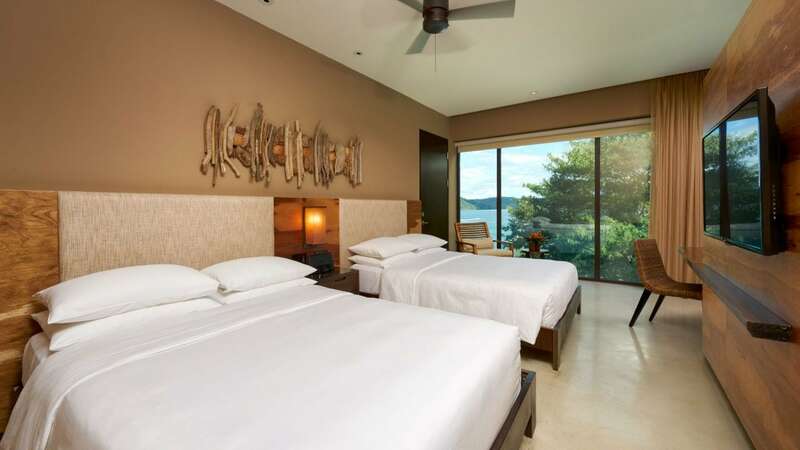 Check into your own personal tree house with views of the Culebra Bay and tropical forest. Modern design blends with touches of character such as woven textiles, solid woods and carved artifacts to highlight the Costa Rican aesthetic in this 560 square foot (52 sq. mt.) 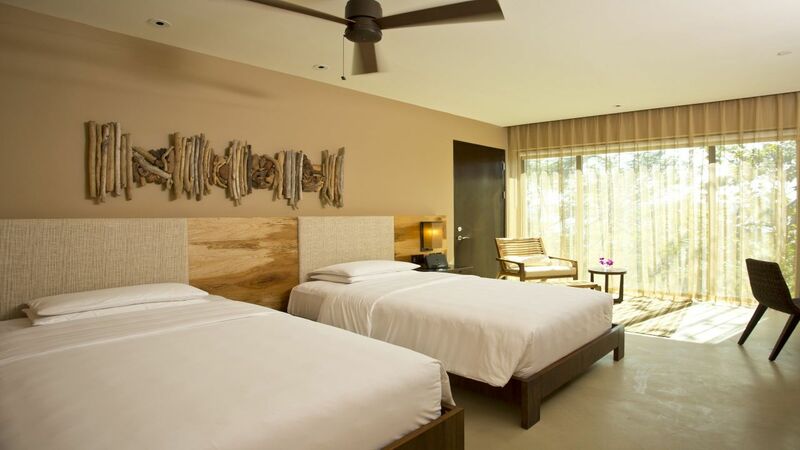 guesroom, featuring two double beds and a spacious balcony that grants partial bay and tropical forest views. The bathroom's walk-in rain shower opens onto the balcony providing a full immersion in nature. Complimentary gifts and deluxe amenities include custom fedora hats and Andaz flip-flops, wireless internet access, local phone calls, non-alcoholic minibar beverages and snacks restocked daily. Connecting room configurations are available, please contact the Resort. 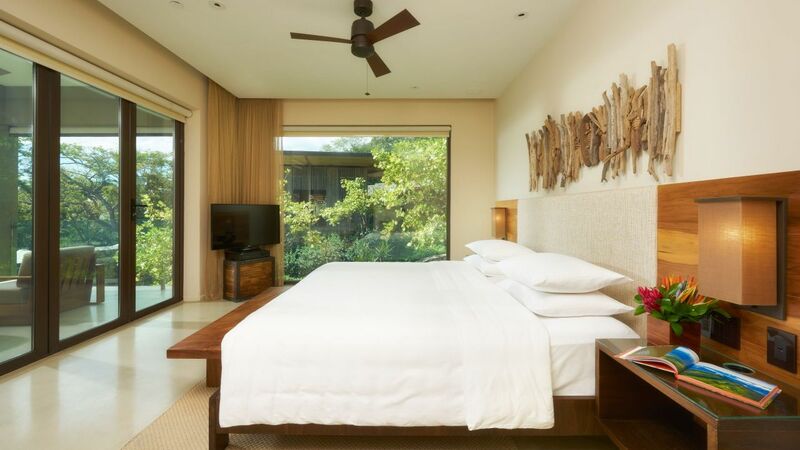 Experience enhanced views and full immersion in the magical tropical dry forest in this 560 square foot (52 sq. mt.) guestroom. The room features one king bed and spacious balcony. Modern design blends with touches of character such as woven textiles, solid woods and carved artifacts to highlight the Costa Rican aesthetic. The bathroom's walk-in rain shower opens onto the balcony providing full immersion in nature. Complimentary gifts and deluxe amenities include custom fedora hats and Andaz flip-flops, wireless internet access, local phone calls, non-alcoholic minibar beverages and snacks restocked daily. 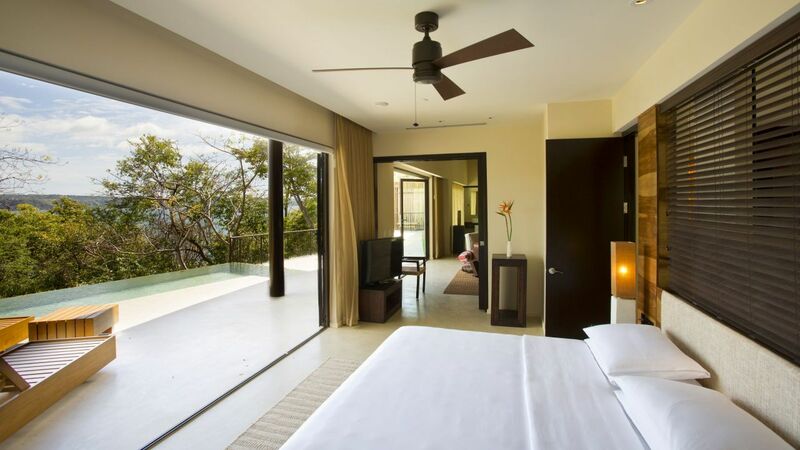 Experience enhanced views and full immersion in the magical tropical dry forest in this 560 square foot (52 sq. mt.) guestroom. The room features two double beds and spacious balcony. Modern design blends with touches of character such as woven textiles, solid woods and carved artifacts to highlight the Costa Rican aesthetic. The bathroom's walk-in rain shower opens onto the balcony providing a full immersion in nature. Complimentary gifts and deluxe amenities include custom fedora hats and Andaz flip-flops, wireless internet access, local phone calls, non-alcoholic minibar beverages and snacks restocked daily. Connecting room configurations are available, please contact the Resort. 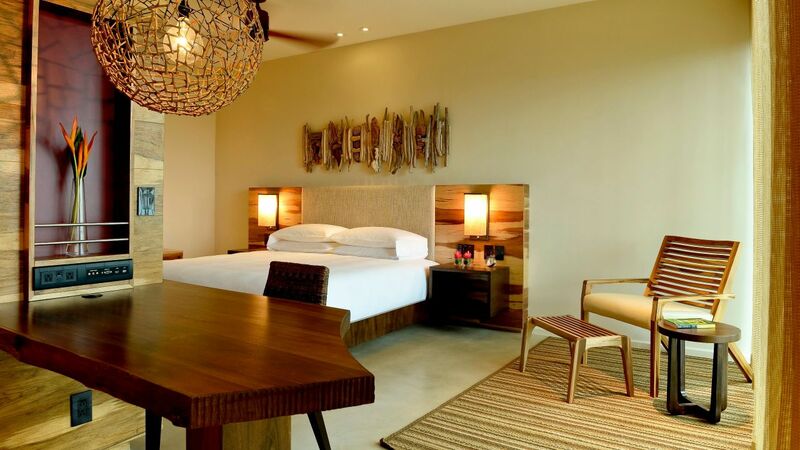 Modern design blends with touches of character such as woven textiles, solid woods and carved artifacts to highlight the Costa Rican aesthetic in this 560 square foot (52 sq mt) room, featuring one king bed and a spacious balcony that grants resort views. The bathroom's walk-in rain shower opens onto the balcony providing full immersion in nature. Complimentary gifts and deluxe amenities include custom fedora hats and Andaz flip-flops, wireless internet access, local phone calls, non-alcoholic minibar beverages and snacks restocked daily. 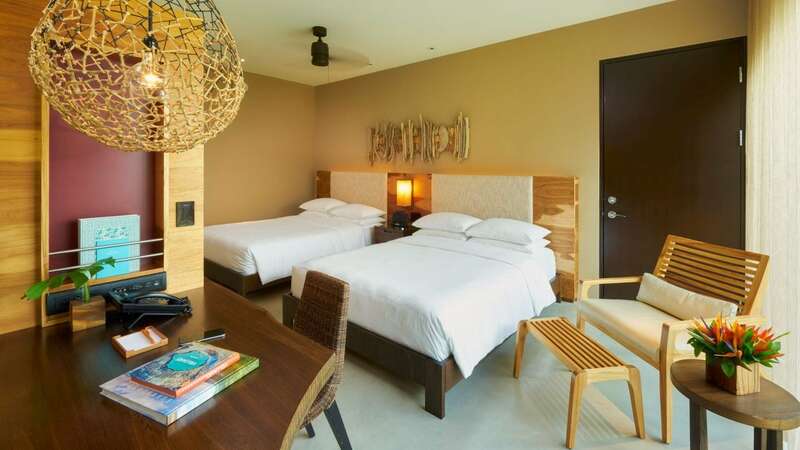 Modern design blends with touches of character such as woven textiles, solid woods and carved artifacts to highlight the Costa Rican aesthetic in this 560 square foot (52 sq mt) room, featuring two double beds and spacious balcony that grants resort views. The bathroom's walk-in rain shower opens onto the balcony providing full immersion in nature. Complimentary gifts and deluxe amenities include custom fedora hats and Andaz flip-flops, wireless internet access, local phone calls, non-alcoholic minibar beverages and snacks restocked daily. Connecting room configurations are available, please contact the Resort.